Cabin kits have been a great way to get a home out in the seclusion of the wilderness, but they don’t have to set you back an arm and a leg. 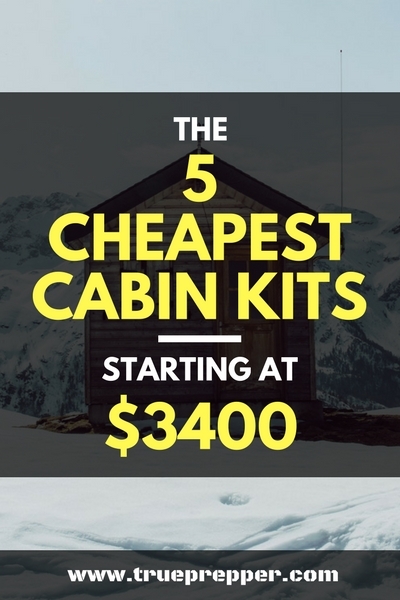 If you are looking for just the bare necessities, you can get a cabin kit for extremely cheap. It may be just a roof and four walls, but it will make for a great off-grid shelter, perfect bug out location, or just a weekend getaway to get unplugged. Hopefully those bullets can help with the decision process. If you have any suggestions, let us know in the comments at the bottom. 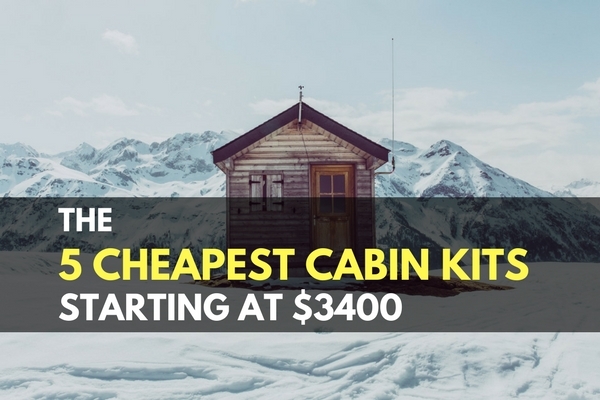 Keep on reading to see the five cheapest cabin kits we could find, with the cheapest coming in at well under $4000. Our first cabin is one of the roomiest and definitely the most expensive of the bunch. eBay has lots of cabin kits to chose from, and it makes shopping for them easy since you can see completed pictures, blueprints, and reviews from the comfort of your couch. This cabin measures 18’ by 24’ with 8” Swedish coped logs. It has three separate rooms and a loft and feels pretty cozy with less than 500 square feet. The big kicker is that it comes in at a great price of $12,000. Feel free to negotiate price and freight- the seller has included a ‘Make Offer’ option to encourage it. The seller is actually from Bachman Log Homes based in Montana, but only offers pricing on eBay rather than on their own website. You can learn more about the cabin here. About half of this cabin is windows, and it is made to be secluded on a lakeside or some other scenic spot. Why not have a great view if you’re in a cabin? This one has eight double paned windows and two double paned doors. It measures 17’ by 13’ for 209 square feet inside the cabin, so it is definitely on the small side. It is basically a roof, some walls, and some windows without room for much else- meaning you will have to get creative when it comes to washing, cooking, and doing your business. You can learn more about the cabin here. We are talking about cabin kits, so why are we calling this the Do-It-Yourselfer? The D logs are shipped in random lengths between 8 feet to 12 feet and you are expected to cut them yourself. That may turn off a few potential buyers, since you will need more equipment. You may change your mind when you see the price: $7,230. A little elbow grease is worth it to me for that kind of savings, and it lets you customize your layout as well. They promise enough lumber to complete a 24’ x 30’ layout at 8’ tall, so you can get 720 square feet with low ceilings. It is a ‘bare bones’ kit that includes just logs, screws, and insulation tape. This just means to me that you can make the cabin your own. Check them out and see if you may want to get your hands dirty for some savings. You can learn more about the cabin here. This 9’ x 9’ cabin is tiny. They fit a few windows and doors in the layout, but the 81 square feet is definitely a drawback. The planks are Norway spruce with tongue and groove assembly. To finish the project, you would also need shingles and some paint or stain. The real attractive part of this cabin is not the windows or French doors, it’s the price: $3,700. They do charge for shipping, but already opened themselves up to haggling by posting ‘or best offer’ on the selling page. You can learn more about the cabin here. This cabin is approaching doll-house or wood shed territory with its size, but it is a functioning cabin. The kit for this adorable A-frame gives you a whopping 73 square feet. This sounds small, but you could fit a king size bed in there and only take up half the space. You may not want to go with a bed that big (especially since it won’t fit through the door) but prioritizing your storage would be a good idea in a cabin so small. Why should you even consider this quaint little cabin? $3,400 SHIPPED. You read that right- this thing comes in at the top of our list as the cheapest son of a gun you can buy new. No freight cost added on makes this a steal if you only plan on using it occasionally or when SHTF. You can learn more about the cabin here. Believe it or not, some people are looking to get rid of their cabins. With logs weighing a few hundred pounds it’s not easy work. Because of this, most used cabins are sold ridiculously cheap if you do all the disassembly and transportation off the lot. You can find these deals on eBay, Craigslist, or the classified section in your local papers. Be prepared to show up with a crew, since they get priced low so the owner doesn’t have to do much. Disassembling an old cabin can sometimes take even longer than assembling a brand new kit, so plan accordingly. Building a cheap cabin can be a fun project and pay off in the long run as well. There are plenty of sizes to look at, and they vary pretty much based on size. If you are skipping main amenities for your cabin, you can save a lot of money by ‘roughing it’ off grid. This can be a bonding time for your family, and help you all be more confident in your self-sufficiency skills. If you know anyone that thinks a cabin house or bug out plan is just out of reach, feel free to share with them. I was surprised with how cheap cabin hunting can go, and they may be too. Keep exploring, stay prepared, and be safe.